Working bee near Verdun Street, 1200 plants in! The working bee of Sunday 28 August put in around 1200 seedlings along the embankment down from the playground and the sides of the creek. A committed group of twelve kept going until nearly all the plants were gone. Adrian's powered hole digger certainly speeds things up. It was quite a long site so we had two planting parties quite separate from each other. A special mention for Suet Mon and her son Thomas, who is in Prep grade - both worked very hard the whole morning. 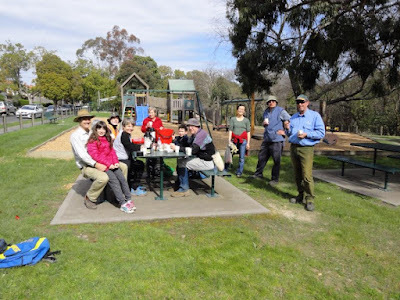 We finished, as usual, with a well earned morning tea. 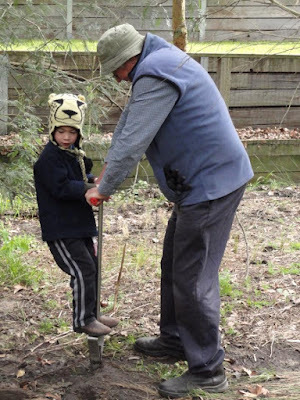 Prep students with their Grade 6 buddies from Canterbury Primary School visited South Surrey Park today to plant indigenous grasses and small shrubs. Adrian and Peter from Boroondara Council and several Friends of South Surrey Park were there to help out. The Grade 6 buddies help their Prep friends plant some grasses and to use the special planting tools to make some holes for plants. Adrian explained how most of the plants we could see around us had been planted over the last 15 years and why indigenous plants are important for the environment and native birds. The students also did a nature walk during their visit. 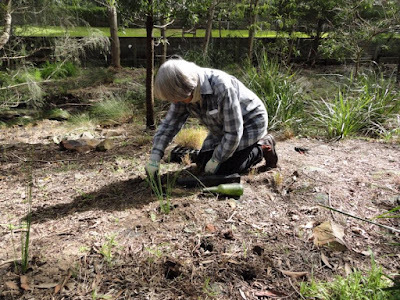 They saw where yabbies are hiding and where the possum spends his day. 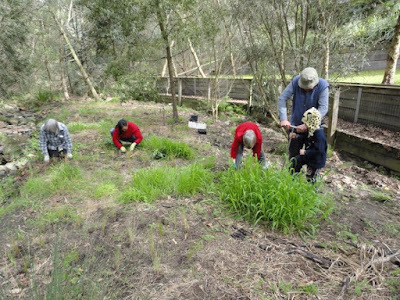 They tasted lomandra leaves and learnt about aboriginal use of the leaves. The very best bit was when Peter Tucker from Boroondara Council showed the children how to close their eyes and listen to the sounds around them. The children had a great time, there were lots of smiles all around.